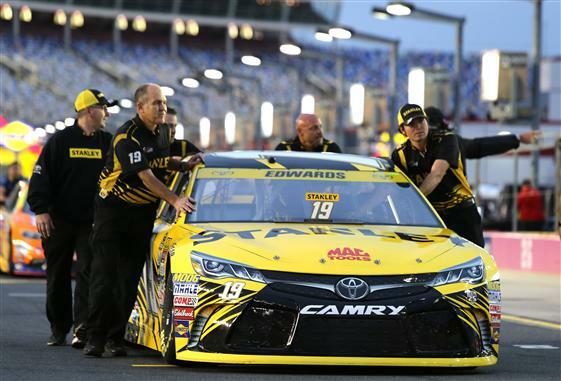 Carl Edwards expects JGR cars to close the gap on Martin Truex Jr. The hare in question is Martin Truex Jr., who drives the No. 78 Furniture Row Racing Toyota, which maintains a technical alliance with Joe Gibbs Racing, and like JGR, gets its engines from Toyota Racing Development (TRD). Truex won two of the three races in the Chase’s Round of 16 and, appropriately, has earned the designation as favorite for this year’s championship. Even though Truex finished 7.527 seconds ahead of JGR’s Kyle Busch last Sunday at Dover, Edwards says the JGR cars aren’t far behind. And, ostensibly at least, the unfettered sharing of information between Gibbs drivers Edwards, Busch, Matt Kenseth and Denny Hamlin and the Furniture Row team has continued into the Chase. “If we didn’t know what engines and chassis and setups those guys had, it’d be really easy to say they’ve got something – they’ve got something special that we don’t have – but knowing what they have and knowing what they’re able to do with it, that’s a motivator,” Edwards said on Thursday at Charlotte Motor Speedway.